Fly Fishing for trout has always been a favorite of mine, but as water levels on the Susquehanna River begin to drop, its pretty hard to pass up the opportunity for some awesome Smallmouth Bass fishing this river has to offer. There’s know doubt that the southern part of the Susquehanna holds an excellent population of smallmouths, but lets not forget about the northern branch. The northern branch of the Susquehanna has produced some fairly large smallies on the fly for me. 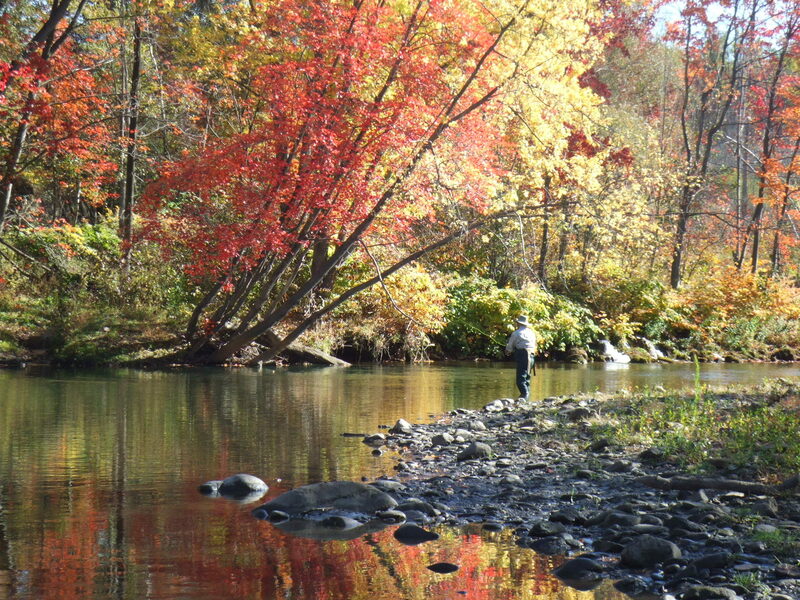 From the Luzerne County line up to the PA/NY border this river is riddled with islands which form the perfect combination of fast water and pools, the perfect habitat smallmouths thrive in. To catch these smallmouths, a 9ft. 6wt. fly rod will do the job nicely.  As far as what flies to fish with, clousers do very well tied in the following colors: chartreuse/white, gray/white, blue/white and orange/brown. Other patterns that have worked very well for me are the beadheaded woollybuggers tied in the following colors: black, orange, olive and brown. Also don’t forget those crayfish and hellgrammite patterns, they’ll usually produce fish when times are slow. Catching smallmouths on the Susquehanna River using dry flies is another story, particularly when fishing the renowned White Fly hatch (Ephron Leukon). Several years ago a good friend and fly fishing buddy of mine talked me into going fly fishing on the Susquehanna River. He said we’ll be fly fishing for Smallmouth bass and Channel Catfish using dry flies. I thought to myself I’ve caught Smallmouth’s on dries before, but Channel Cats; you got to be kidding! Heck, when I hear anglers talk about Channel Cats on the Susquehanna River, what immediately comes to mind are those Y sticks stuck in the ground at the rivers edge holding up spinning rods. And those stinky slimy baits that are used to lure those Channel Cats in; such as Night Crawler’s, Leeches, Shiners and Chicken Livers to name a few. Anyway, it was an evening trip late in July during the peak of the renowned White Fly (Ephoron Leukon). I’ve read about this hatch in detail but I never had the opportunity to fish it. I can recall sitting in front of my TV watching the local news reporters standing on the bridge in Wilkes-Barre reporting this White fly hatch extravaganza. The hatch gets so heavy at times; the dying spinners carpet the bridges going over the river creating very slippery driving conditions. At that point the city of Wilkes-Barre is forced to close the bridges going over the river to prevent any further accidents. City officials won’t open the bridge until the spinners are done falling and sweepers complete the cleaning of the bridges. I read that the hatch should start after sunset about the third week of July and lasts until the second week of August. That evening the hatch started about twenty minutes to a half an hour after sunset, we started to see some White Flies skimming the surface flying up river looking for a mate. It seemed that that’s when the Smallmouths and Rock Bass began to feed, revealing themselves by leaving a tiny ripple on the surface. Within half an hour we connected with eight or nine Smallies using a White Compara Dun #10 but soon after that the hatch got so heavy our one fly on the water was insignificant to literally millions of White Flies on the water. So we watched the hatch until it ended, by that time it was getting dark. My friend suggested we head down to this back eddy were he knew the dying White Flies would accumulate. When we got there the spinners were at least1/2 inch deep with more on the way. At that point I realized that Smallmouths weren’t the only species of fish to take advantage of this White Fly hatch. Amongst the carpet of dying spinners there were these moving wakes of gulping and bubbling swirls. It was an awesome sight to see, there was a pod of about a dozen or so gigantic Channel Catfish cruising in a zigzagging motion gulping as many dying White Flies as possible. We presented our White Fly imitation to the gulping cats with little success. But when I tied on my White Deer Hair Moth patterns I immediately connected. Catching one of these Channel Cats on dries is nothing more than a timing issue and a bit of luck. Basically what you need to do is single out one of those cruising Channel Cats and gently but very accurately lay your imitation in its path. More often than none these cats seem to overlook your fly, probably because of the mass of dying spinners, but when you finally connect its one hell of a battle and worth the wait. That evening we hooked and landed 3 Channel Cats which ranged from 23 to just under 26 inches and one granddaddy that measured over 31 inches in length. When you hook into cats this big you’re in for a long battle. Since that trip I make it a point to have at least a half a dozen or so moth patterns and White Fly imitations in my fly box and several evenings open during this two week or so White Fly Madness. So give the North Branch a try, there’s plenty of access points: Wilkes-Barre, Falls, Harding to name a few. "Fly fishing the Susquehanna with Joe for small mouth bass was incredible, and truly an adventure!!" 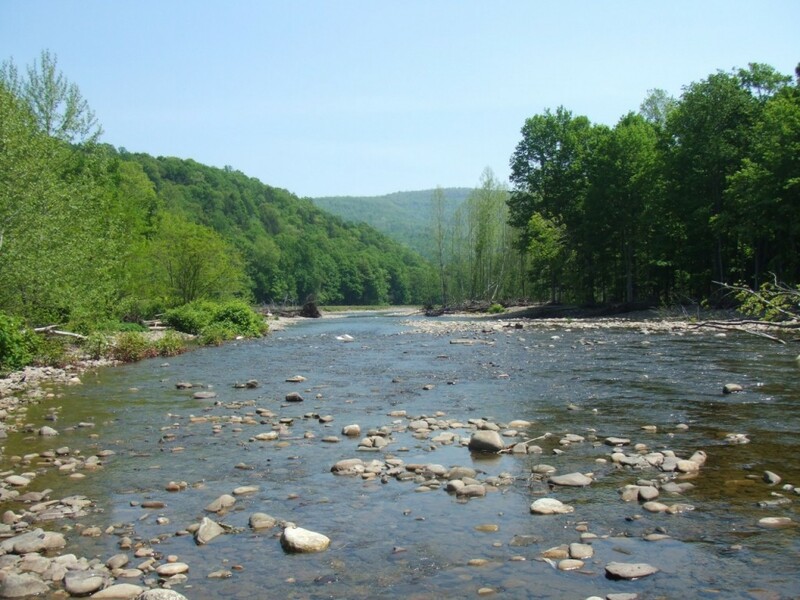 Specializing in fishing the Lackawanna River, Northeastern PA’S best wild brown trout fishery. 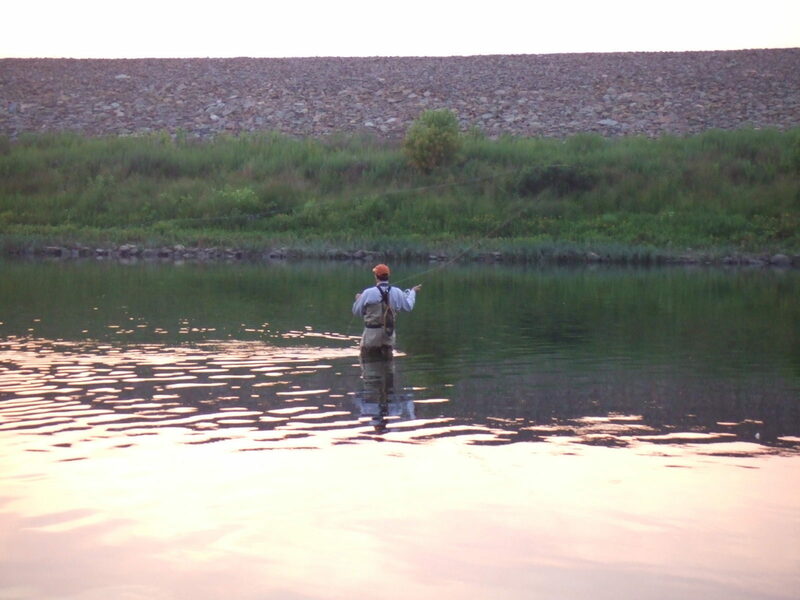 Catch brown trout in excess of twenty inches with great hatches all season long.